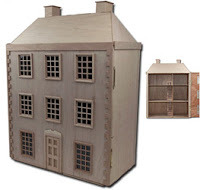 What's your dollhouse wish list? New Valentine's Day Miniature Printables! But that hasn't stopped me from doing some wishful window shopping lately. There are a few houses I'd really love to get, and my mind just starts spinning with ideas every time I look at them. The list that follows is my "Will Conceivably Be Able to Get Someday" list, not my "Ha! When I Win the Lottery" list. The one that has been on my wish list the longest is the front-opening Gloucester by Corona Concepts. I like the arrangement of the house, but I think part of what attracts me is the windows and the corner details, which remind me of the houses in Brittany where I used to live. Because that's what I want to do with it, turn it into a Breton-style townhouse. 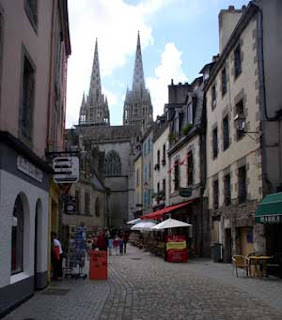 (Actually, I think it was explained to me that leaving the corner stones exposed is a Norman style, while in Bretagne they tend to plaster over them, but you still see both styles a lot there.) I've been collecting bits and pieces for years for my maison bretonne! Another front-opening house I really like is 333 Franklin Street by Real Good Toys. What is it about front-opening houses that is so appealing? 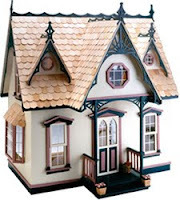 Is it because they're unusual here in the USA, being more typical of English dollhouses? Is it the realism of an entirely enclosed house with all four walls? Is is the space you can save by not having to turn it around to get inside? Yes, yes, and yes. And add, less to dust since it's enclosed. Franklin Street is a simple style, but offers a lot of possibilities. I'd even like to do a couple of them - one as just apartments, another with a shop downstairs, maybe a dance school upstairs, and who-knows-what on the top floor. 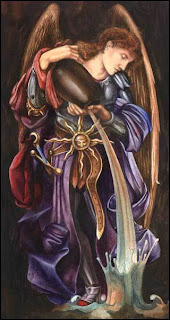 And another for the cafe, bookstore, and miniatures shop! You could do a whole street of them and each one could look completely different. 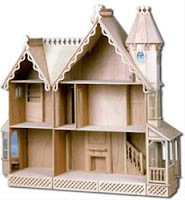 The Victorian Townhouse, also by Real Good Toys, is another with a relatively small footprint but big potential. I like the interesting bay tower (and not just because it opens in front!) It also has movable room dividers, so you can really customize the layout. I'd love to do one as a single home, and another split into apartments. I see another street in the neighborhood! The last one on (this) list is the McKinley Wall Display house. Another space-saver, this one hangs on the wall but is still quite roomy. I love that it has porches (many wall-hanging houses don't) and an interesting shape and details (many wall-hanging houses don't.) It also has three handy storage drawers at the bottom. Has anyone built this before? I'd love to see more pictures. So what houses are on your wish list? What dreams and plans do you have for them? 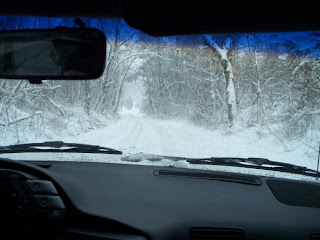 This is a rural area, and there's 2 big hills to get out of my area to the main roads, so once they ice up I'm pretty much stuck here until it melts. After the accident I had trying last month, I'm not taking any chances. My face has healed up, but it left a scar by my eye. I'm now considering a career as a pirate supermodel. 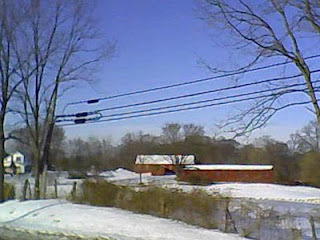 This is the same red barn I photographed a few months ago, down the road from here. 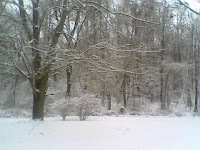 Today was gorgeous and sunny, but they say there's more snow on the way this week! 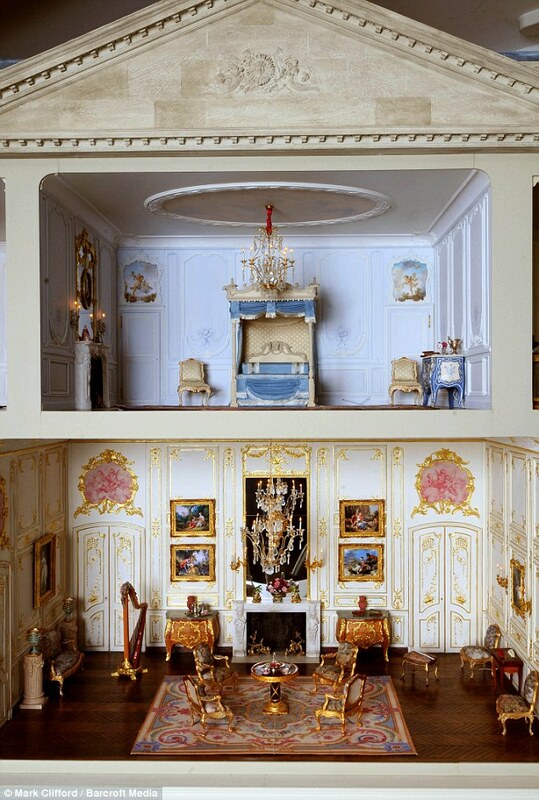 Kevin Mulvany and Susie Rogers of Mulvany & Rogers have created a fabulous miniature palace called "Chateau Antoinette." 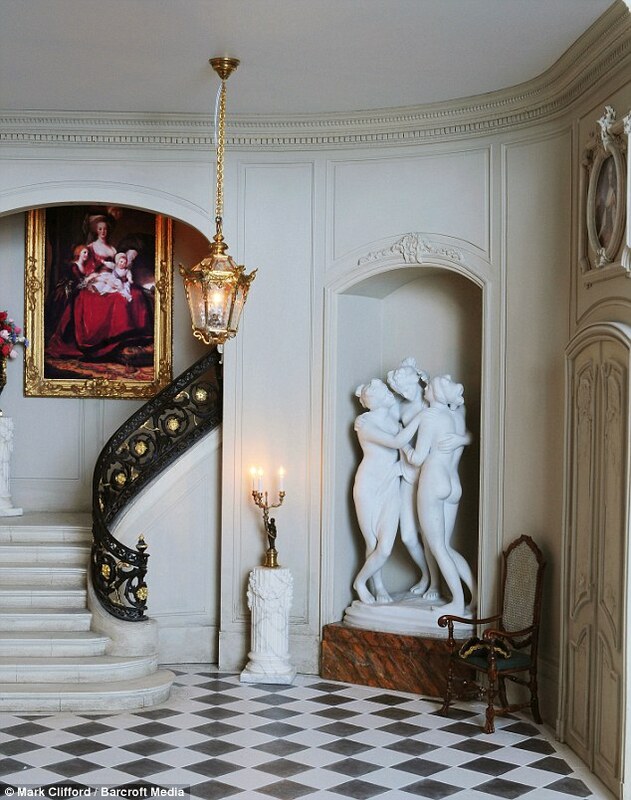 Created for an American collector with a passion for Marie Antoinette, the miniature takes elements from Versailles Palace, the Chateau de Bagatelle and the Palace of Fontainebleau. 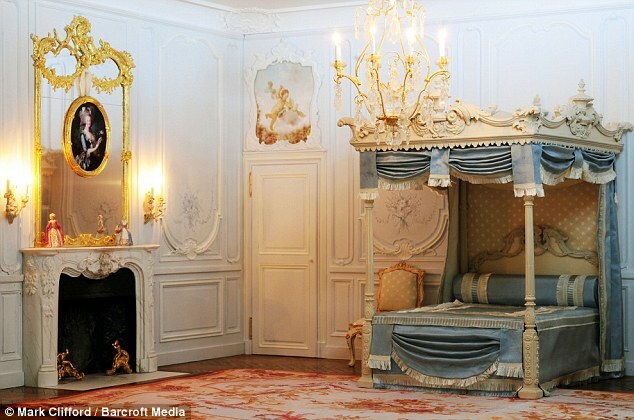 The chateau has six rooms and measures 42 inches high, 67 inches wide and 20 inches deep. Only the finest miniatures and materials were used - real crystal and gold, luxury woods, sterling silver. The table is set with porcelain Sevres plates, real glass goblets, and sterling silver cutlery. The walls are decorated with 22-carat gold leaf and tiny oil paintings. Over 10,000 hours of work went into creating the masterpiece. 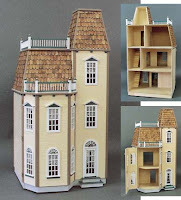 Mulvany and Rogers have been making miniatures for over 25 years and are known for their miniature recreations of real castles and mansions. Based in Holt, Wiltshire, England, they travel around the world researching their projects. They are exacting about the details, even including fireplace soot and dust in the corners of rooms. "The mood, the lighting, wear and tear are all considered. It all counts to making a true replica," says Susie. See more photos and read the full article about Chateau Antoinette. 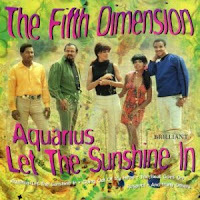 Happy Birthday to all you Aquarian babies out there! I loved that song when I was a kid! Still kinda do. 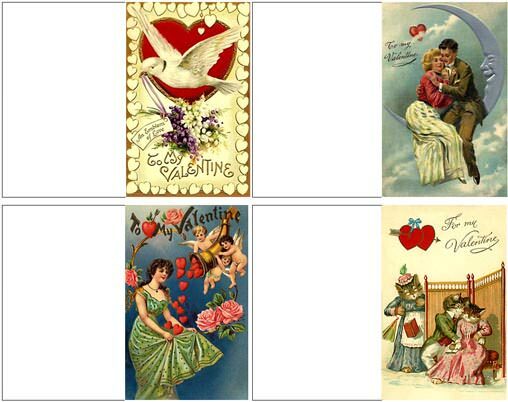 I've created some new printies for you for Valentine's Day. 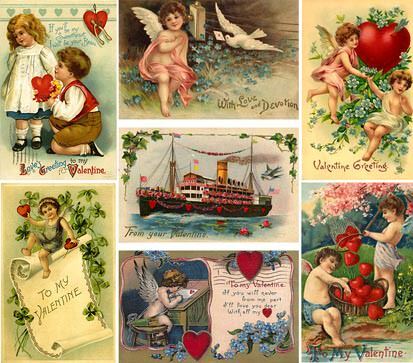 These cards and postcards date from about 1900-1915. They are high-resolution images to give you good quality printies. They'll be available here and in the Printies section of my website, where you'll also find some new links to other miniature printables. Click the images for a printable page. Print at high-quality, and use heavy paper or light cardstock for the best results. I'm late in posting this, but I did do the drawing this weekend for fans of my new TreeFeathers Miniatures Facebook page. And the winner is... Kathi Laugherty! Kathi, you've won a 6-volume set of TreeFeathers Miniatures books, of the subject of your choice (cookbooks, gardening, children's books, Christmas, etc.) Thanks everyone for playing, we're up to 64 fans already! And don't forget to check out the new Facebook group, Miniaturists: Visionaries with Short Attention Spans. 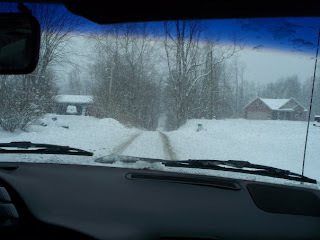 You can post photos, participate in discussions, and keep up on the latest mini news on Facebook!